This new 3 bedroom, 2 bathroom (with Wifi, Netflix and baby equipment), waterfront apartment is situated in a luxury complex in Greencastle, Inishowen, known as the 'The Fort' built in the grounds of the historic Napoleonic Fort and Martello Tower. The Fort stands on a cliff top overlooking Lough Foyle and is a short walk away from the famous Greencastle fishing village, golf course and Magilligan Ferry (15 minute crossing takes you to the North Coast of Northern Ireland - Portrush, Portstewart, Castlerock etc. The Inishowen coastline has some of the most picturesque landscapes in Ireland with many award winning golden beaches. Most of the peninsula has been designated a European special area of conservation helping to protect migrating birds and indigenous wildlife. The surrounding waters are renowned for their variety of fresh fish making Greencastle one of the busiest fishing ports in the country. Local amenities include golf (6 golf courses in the Inishowen area), sailing or water skiing on Lough Foyle, horse riding, fishing, walking, climbing and cycling. A 15 minute shuttle car ferry service to Magilligan Strand in Northern Ireland operates in the Summer. The local village, a walk away is renowned for its restaurants featuring fresh fish and its lively pubs. There is a scenic shore walk to the village and golf course. Derry City Centre with its comprehensive shopping, and recreational facilities is accessible in approximately 25 minutes by car. There are also other retail outlets a similar drive away. The Fort is steeped in historical significance and is located in a private road with several houses and two apartment buildings each comprising of 8 Apartments. Number 38 is in the second apartment complex situated at the end of the private road. The interior of this stunning high end apartment was finished in 2014 (the last apartment to be completed). The finish is gold star with honeycombe sinquastone worktop and solid oak kitchen units. There are three bedrooms, the master with en-suite shower room has a king size bed (firm mattress) and fitted wardrobes, the double bedroom with double bed and fitted mirrored wardrobes plus a third bedroom with two single beds and fitted mirrored wardrobes. There is a travel cot and high chair. The family bathroom with double sinks is located close to the latter bedrooms. The terrace is furnished with table and chairs and you can sit outside the kitchen sipping your morning cup of tea and only the dolphins can see you. Loungers and beach chairs are provided in the apartment for your comfort. The property has just been fitted with broadband so there is free WiFI and it also boasts Netflix. 2015 was our first year renting out this property so currently there are just 11 reviews. However, to get an ides of the standard of our holiday lets for our other properties look at reviews for 841091 HomeAway (Seabathing Hospital Margate) or QN3172 Brittany Ferries (France) - Barfleur. We also have a 4 bed detached house located 5 mins away (Homeaway 6923570) finished in 2017 and an apartment in the middle of Moville 8467875. We live and work in London, have day jobs and our joint hobby/ business is buying holiday homes in unusual locations and letting them out as holiday lets. It is not just financial, it gives us enormous pleasure when people have amazing relaxing holidays and then return another year. We try to provide for every eventuality in the apartment. My husband was browsing the net and showed me a picture of the view from a similar property for sale in the Fort. The view of the Lough through the floor to ceiling windows with a ship passing by blew me away. I sat for 10 minutes just looking at the view and knew we had to buy 'that view'. We did. 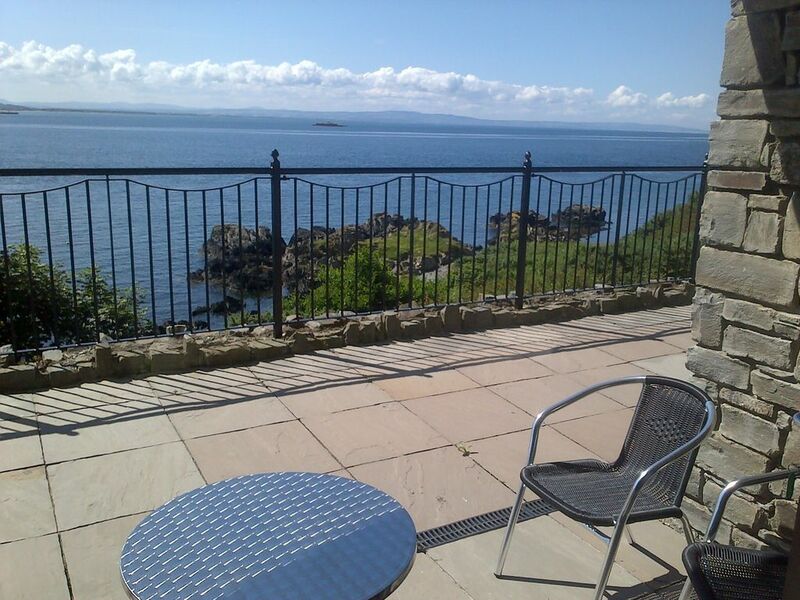 We chose this particular apartment as it has a wrap around large secure private terrace overlooking Lough Foyle. Our apartment was finished in 2014 and my husband fished (he caught a number of fish!) from the rocks outside the apartment soon after completion with dolphins swimming around in front of him. I sat reading on the rocks. Heaven. Broadband has just been fitted so there is free WiFi. Large Family bathroom with shower above, double sinks and fitted units. Washing machine/ dryer is housed in big cupboard off the bathroom. There is a combination boiler served by calor gas. We have stayed there in bitterly cold weather and the flat was cosy. The view of one storm was breathtaking. All the beds will be made up for your party and is included in the price. Washer drier as well as airers provided. There is also a small drying area off the bathroom for hand wash items. Washer drier as well as airers provided. There is also a drying area with area off the bathroom. Broadband has been fitted and there is free WiFi. I bath towel, 1 hand towel and 1 flannel will be provided for such person staying at the property and is included in the price. Two three seater sofas , TV, bookcase andplenty of lamps and side tables. Built in with simple controls. Big built in fridge freezer. Three shelves in the freezer. New built in electric oven. We stock up on all the basics and ask that people just replace the things that are running low. This ensures that no one has a huge shop to do on arrival. It will be a home away from home with plenty of dishes etc for 6 people. The fitted solid oak kitchen comprises of sinquastone granite worktops and upstands, dishwasher, fan oven, hood and microwave. Filter maker, cafetière and hob espresso maker provided. There is a large table in the open plan dining area with 6 chairs in the apartment. TV with DVD player in lounge and smaller TV in Master bedroom. English freeview as well as Irish TV. In lounge. Videos in bookcase. Sheltered area with table and 6 chairs. 5 minutes away in Moville - see photo. Magnificent huge private gated terrace overlooking Lough Foyle. Greencastle golf club just up the road with many others nearby. The car park at the back of the complex is a level higher than the apartment (built into a ciff). There is a lift and the patio doors open wide onto the magnicent gated private terrace. Once in the apartment everything is on one level. The location of this apartment will blow you away. The sea life is mind blowing - Dolphins, Whales you name it. You will not be able to take your eyes off the views and revel in the history of the place. If you do not want to pay by credit card a bank transfer is possible or a cheque sent - whatever suits. The apartment is situated in a unique setting of an old fort. It sits almost on the cliff edge overlooking Lough Foyle providing fantastic views from the master bedroom, lounge and kitchen - great views regardless of the weather. All rooms were well furnished and beautifully presented; loads of wardrobe space, plenty of hooks in bathroom & bedrooms, no shortage of coat-hangers. The kitchen was extremely well stocked with crockery, cutlery and all necessary machines! Self-catering was a breeze. We did dine in once or twice but also sampled a number of excellent local restaurants. We were looking to relax and chill out, pottering about locally. There are a number of easy local walks. We even managed a round of golf on one of two good local courses. The apartment would also be a good base from which to explore other parts of Donegal. This has to be one of the best properties we have ever stayed in. We look forward to returning in the future and would happily recommend it. travelling needs. The Condo was spotless, beds were comfortable and the view was amazing. We would definitely recommend to others. This was literally one of the best highlights for our trip this year. The condo is beautiful with full amenities. Overlooking the Lough and hearing the water while sitting on the deck was very relaxing. The area is very peaceful. We should have thought about booking a day or two longer because there was still so much to see! Elaine was a pleasure to deal with throughout! Fell in love with Northern Ireland quite honestly...❤️! Would highly recommend this... as a convenient location... as well as fully equipped to cook/entertain at home if you so desire! Thank you so much! PS-I wanted to apologize because we did not run the dishwasher and did not realize it until we were 3 hours away!!! Pictures don’t do it justice, magnificent inside & out! Elaine was a pleasure to deal with. The apartment is very comfortable & well organized for guests. We had no trouble acomplishing tasks, thanks to her attention to detail. The kitchen is equipped with quality appliances & cookware. The views from the interior and balcony are spectacular at all times of the day. The historical significance of the Martello Fort & adjacent Northberg Castle provide a charismatic backdrop. We found everything we needed to cook healthy meals within a reasonable driving distance from the complex. We enjoyed our time here and would not hesitate to stay here again in the future. Very Nice living quarters! And, the owner provides exceptional service. Great condo, friendly neighbors and fantastic location. Not many times does one get to rest in an old fort while in a new condo. Very interesting! Fantastic, well presented apartment. Stunning views and excellent location for a quiet, peaceful holiday. The pod of dolphins making an appearance on the last morning was a bonus. This magnificent inishowen apartment with phenomenal views and large secure private gated terrace, overlooks Lough Foyle. Dolphins and other sea life are clearly visible from the apartment as well as fishing boats, cruise boats and the ferry from Magilligan to Greencastle. The pubs, restaurants and takeaways are just a short walk away. Similarly with the Golf - just walk there. The walks, especially the coastal paths are breathtakingly beautiful- with so much to explore. If you fancy some retail therapy there are two shopping centres in Londonderry - Debenhams, Marks and Spencer, etc. TK Max is located at one of the retails parks. Moville is a 5 mins drive away. Linens, towels are included. please bring own Beach Towels. Wifi is included in the price. As with all holiday rentals there is a £150 returnable security deposit payable locally when you arrive and this will be handed back on departure. Note: For those from the UK most phone signals can be received in the apartment and most certainly from the terrace.